Did you know the fashion industry is the world's second-largest polluter, right behind the oil industry? Or, that one-in-six people work in the global fashion industry? A majority of these workers are women earning less than $3 per day. Approximately 80 billion garments are produced new every year. Just imagine all the resources that this requires. There is no doubt, the fashion industry greatly impacts our environment, and directly on millions of people's lives from the picking of the cotton upwards through the production chain. Unfortunately, more often than not, ethics and glamour do not co-exist. However, there are countless people our there trying to change this sad fact, and new Australian fashion start-up Thread Harvest is one group who are joining in the revolution taking place in fashion at the moment. 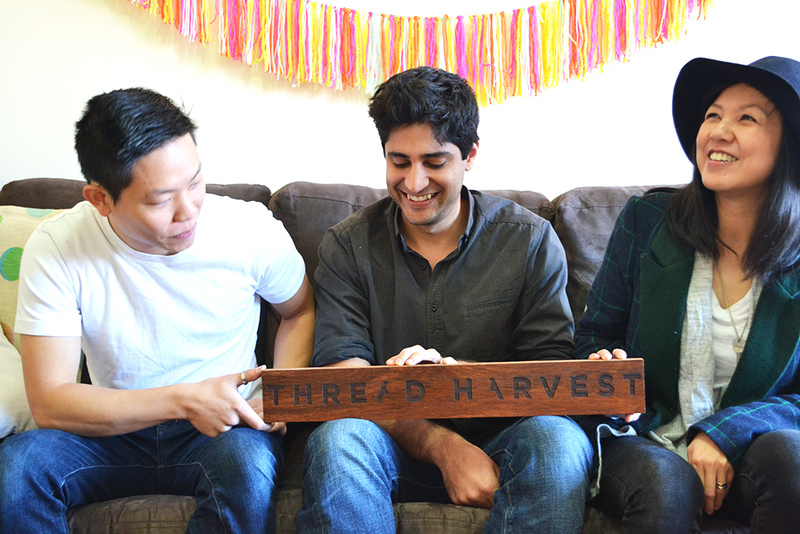 Thread Harvest is an online shopping platform for the conscientious shoppers, change-makers who care about both style and substance, and who embrace higher virtues of empathy, respect and compassion. “Our philosophy is fairly simple, we’re about fashion that is as beautiful in its impact as it is to look at. For us, we love seeing the change our work is generating. We measure our success not just in terms of the lives changed and environmental causes supported down the supply chain, but also by the number of people who each day put on an item of our fashion and feel good about their impact." Recently, 1 Million Women teamed up with Thread Harvest to talk about the growing sustainable and ethical fashion movement. We also had some fun styling different looks. 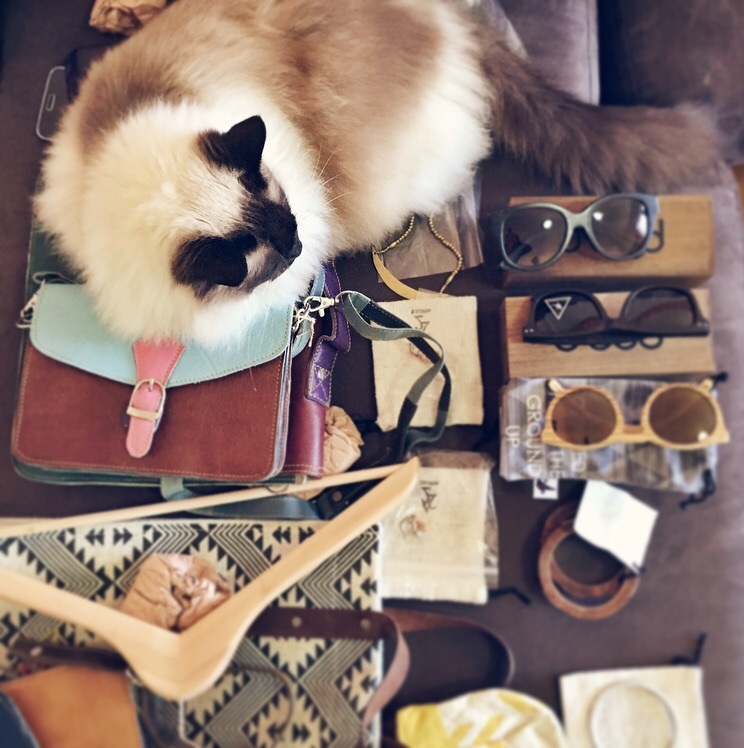 Even Bindi's cat wanted a part of the action, claiming most of the accessories for himself. Here are the conscious fashion looks the wonderful Eve (Thread Harvests' resident stylist) put together for us, and even more importantly the inspiring stories behind some of the pieces. Description: The Pacaya Dress features short sleeves and a long length that falls right above the ankle puts a new spin on the classic maxi-dress. The sleeves and neckline are cut in a raw hem and the bottom has two slits, one on either side. The ivory leaf pattern is hand-screen printed onto the top, middle and bottom of the dress, creating a beautiful silhouette for any body shape. The dress is made in a unique place. Nestled in the heart of Phnom Penh lies a workshop of creative collaboration, as women create beautiful apparel from locally sourced raw materials. Eco-friendly materials such as remnant jersey and naturally dyed, hand-loomed cotton are used to produce scarves and apparel. Many of the artisan women are overcoming poverty and abuse and find dignity and opportunity through the work. Story Behind the Label: Raven + Lily is a socially responsible brand dedicated to empowering women through design partnerships and sustainable economic opportunities. The company was founded by two dear friends Sophia Lin and Kirsten Dickinson who share a passion for fashion and ethical design. Raven + Lily was created as a platform to utilize those passions to alleviate poverty among women. The label now employs over 1000 women around through world crafting a range of fashion accessories and apparel. 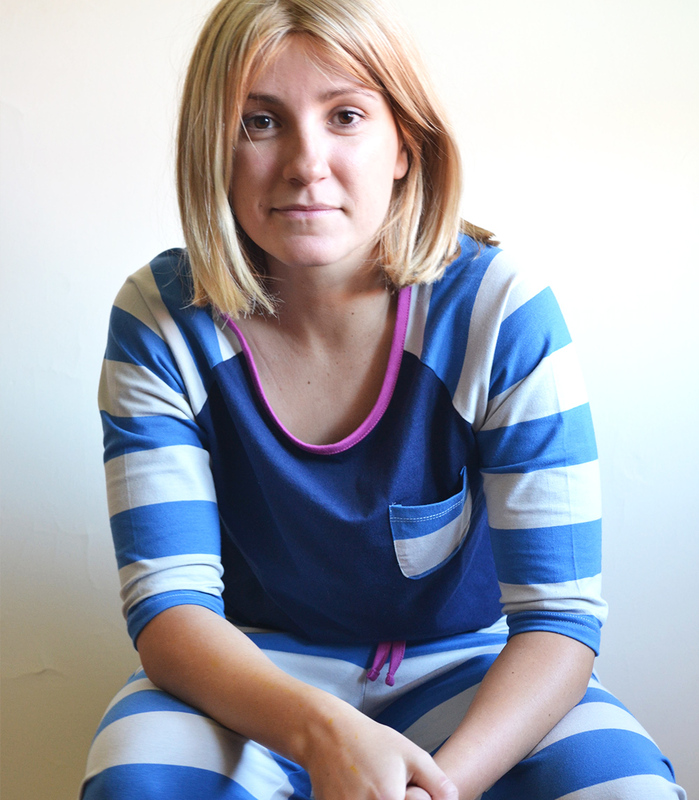 Description: These pajamas are ethically stitched in fair trade conditions, all cotton used is GOTS certified organic, and they were dyed using AZO and formaldehyde-free inks – better for the environment and better for the wearer. Story behind the label: Founded in 2011 by Kelly Elkin and Betony Dircks, ALAS is a Sydney-based, organic sleep and loungewear label with a focus on enigmatic prints and relaxed silhouettes. ALAS' sleepwear is made in India where the cotton is also grown, spun, woven and dyed. All of the garments are constructed with GOTS (Global Organic Textile Standard) certified organic cotton, in fair labour, sweatshop-free factories. They visit their producers regularly to maintain strong relationships and trust between all parties. Staff enjoy full medical care, use of AZO and formaldehyde free/low impact dyestuff for solid dyeing and printing, a generous living wage and access to loans and support. Description: These bags are made from recycled and factory offcut leather that would have otherwise been wasted. They have less impact on the environment, reduce waste and help create work in the developing world. 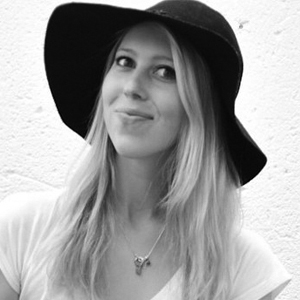 Story Behind the Label: What Daisy Did was founded by fashion and art students Daisy and Ozric. During travels through India, the duo came across a man named Manish, a skilled manufacturer of upcycled discarded leather goods who had recently lost much of his work after manufacturers shifted their operations to China. Not long after, Daisy and Ozric's own range of upcycled leather bags was being designed, with Manish and his team of leather workers stitching the pieces. The company opts for timeless styles and hard wearing materials in a protest against synthetic and disposable fashion. Beyond caring deeply about environmental sustainability, the pair also ensures all artisans are paid a living wage and that working conditions are safe and meet the highest standards. 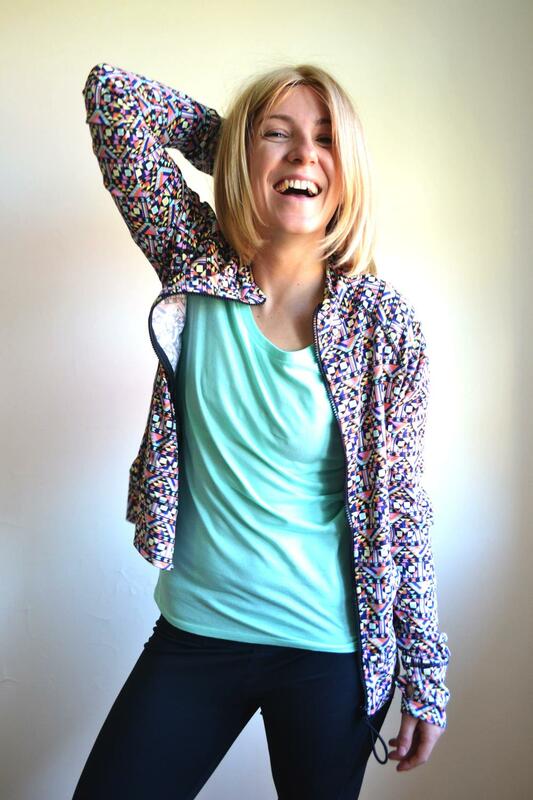 Description: The Lori Zip-Up Workout Jacket is made with polyester recycled from water bottles blended with spandex then brushed on both sides to create a super soft feel. 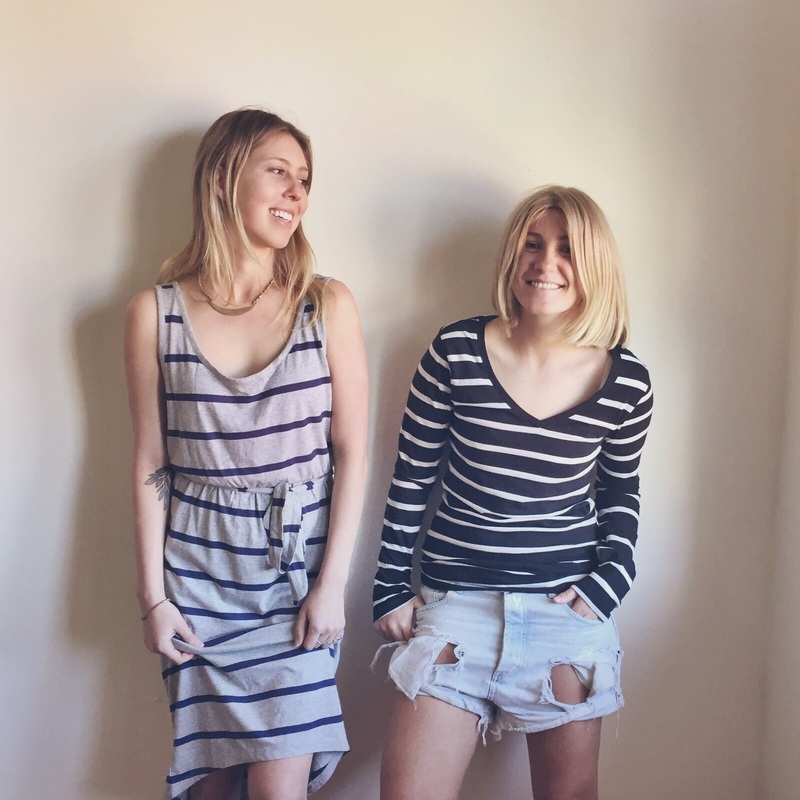 Story Behind Label: Threads 4 Thought started out as a sustainable t-shirt company and quickly expanded after the husband and wife duo struck a chord with the style conscious market that cared deeply about sustainability. 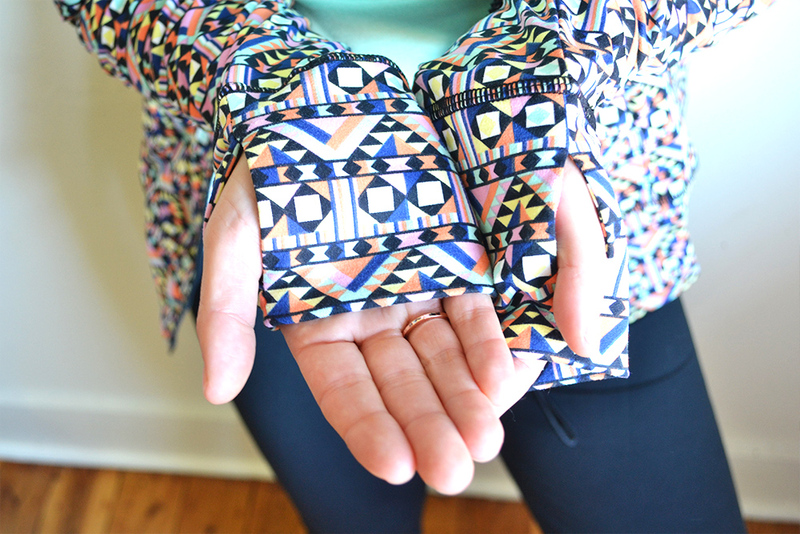 The company primarily uses two fabrics – organic cotton and polyester made from recycled water bottles. Threads for Thought have made a commitment to using organically grown cotton, which does not use harmful insecticides, pesticides or GMO seeds in the growing process. 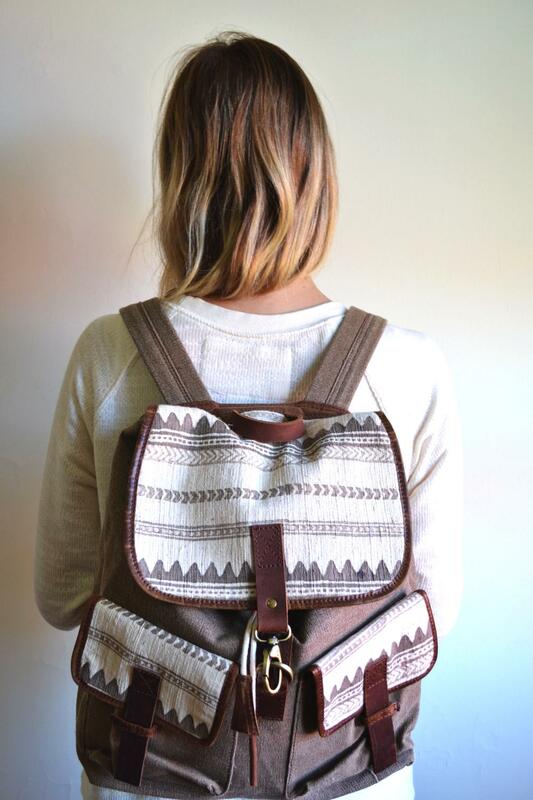 Also by using recycled polyester, they are able to reuse plastic bottles and turn them into fashion rather than waste. 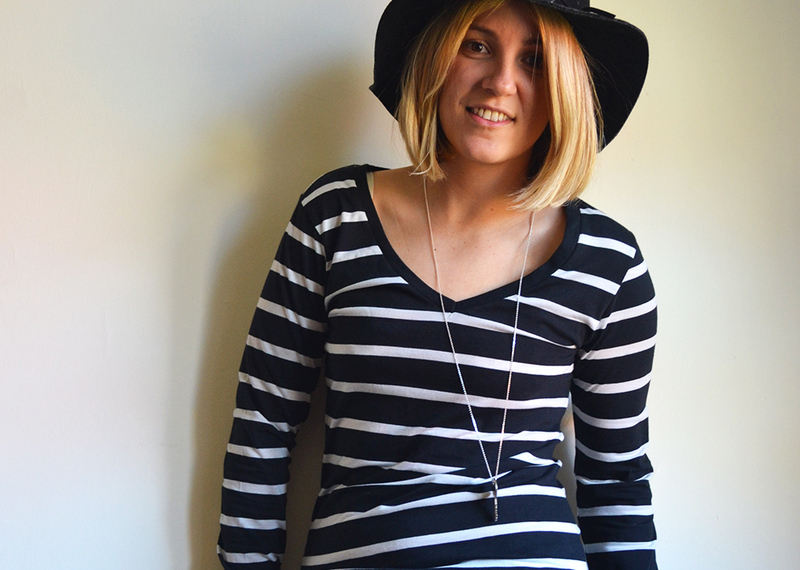 Description: This classic stripe v-neck comes in a flattering cut and super soft organic cotton and recycled polyester blend. Story Behind the Label: See Threads 4 Thought story above. Description: This necklace comes with a 24″ silver toned chain. 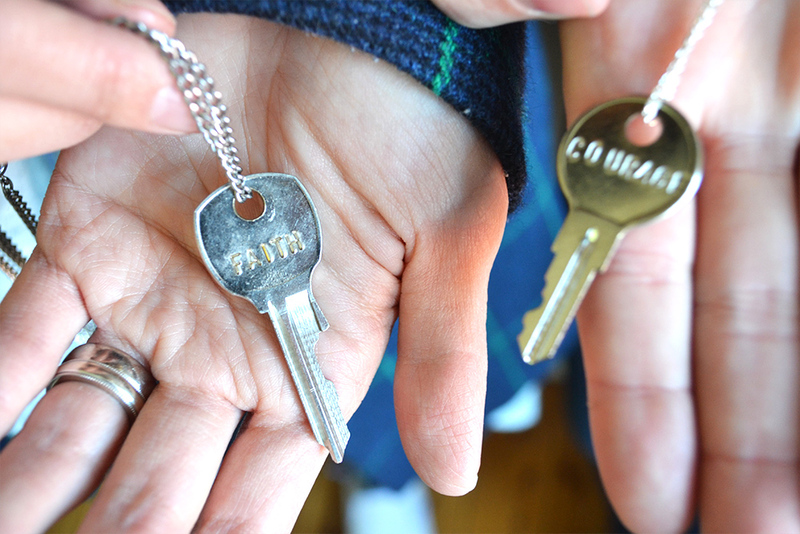 The upcycled key is to be worn until you meet someone who needs the message on the key more than you. Each key had been hand engraved by an individual transitioning out of homelessness, meaningfully employed by The Giving Keys. That's when I saw them. "The homeless couple sitting under an umbrella holding a sign that said "Ugly, Hungry and Homeless." I went to them, I'm not sure why, and fell in love. Their names are Cera and Rob. They were 23. Their stories were profound… and I ended up cancelling my plans for the evening to talk to them. I complimented Cera on her necklace. She said she had made it herself. A light bulb went off. I had an 'Aha Moment' right there in the restaurant. I flung my hands up in the air and screamed, "Ahhhh! You guys are the missing link! You have to be my business partners!" I showed them "The Giving Keys" website and it was 'on.' I knew nothing about the fashion or the jewelry industry when this all started, but the word of mouth has spread, and now The Giving Keys are being sold all around the world. So I've hired more great people, all trying to transition out of homelessness, just to keep up with the orders. The goal is to keep expanding to get as many people employed and off the street as possible. Description: Made by artisans in Laos from Vietnam War-era bombs, plane parts, and other aluminium scrap, each Peacebomb Bangle is hand poured and cast in wood and ash molds. Each bangle includes a donation to demine 3 m2 bomb-littered land. Story Behind the Label: Article 22 designs beautiful and meaningful collections that tell unknown stories and give back. 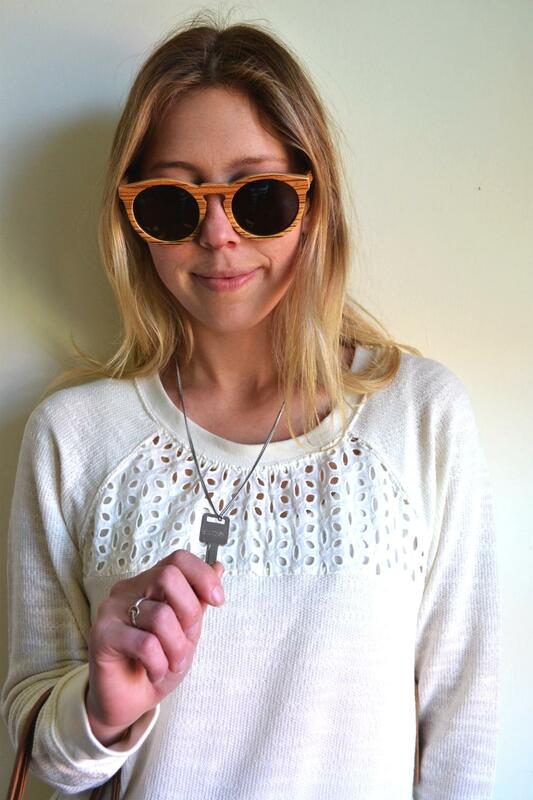 PEACEBOMB, the first collection, is jewelry made from Vietnam War era bombs by Laotian artisans. ARTICLE 22 seeks to embody a new luxury that intimately relates our objects and ideas. The collection comprises classic shapes cast with Peacebomb metal that tell the story of how Laos became the most heavily bombed country in history and the artisans who transform bombs and war scrap to jewelry taking a constructive approach toward the destruction wrought by war. 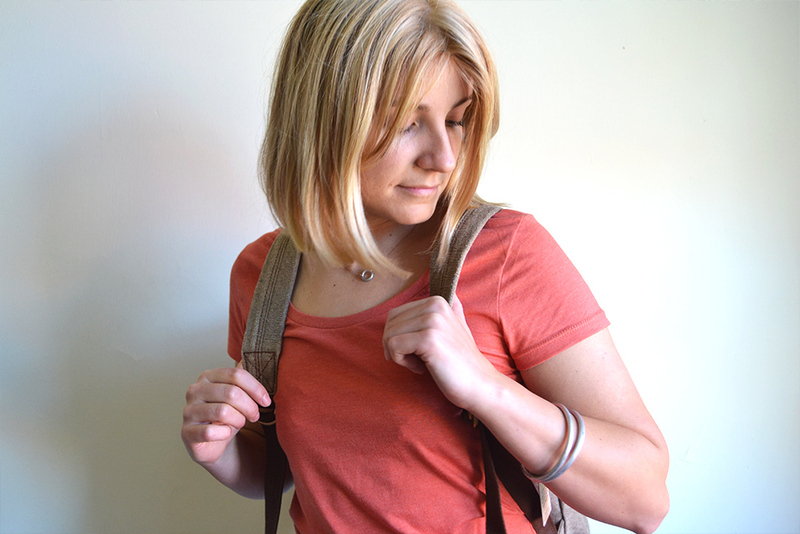 Description: Made with durable canvas and 100% genuine leather trim, this backpack is great to carry what you need to work or class, or just on a day out. 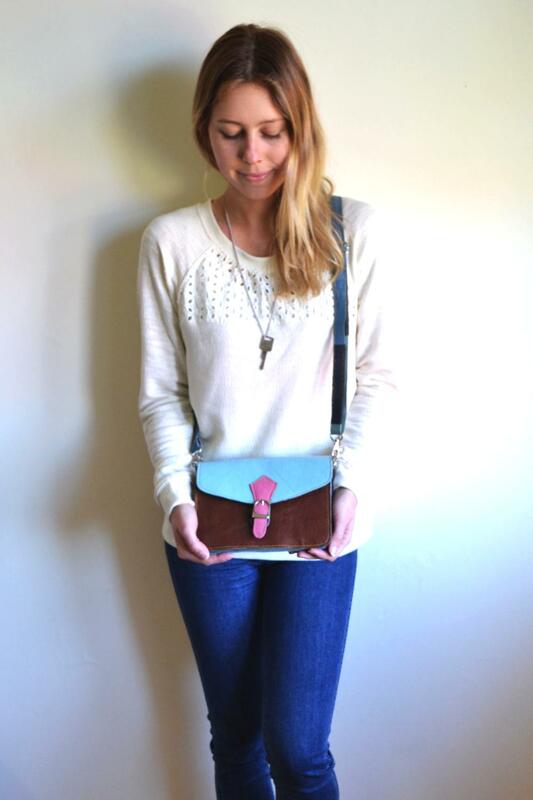 Each bag has been lovingly crafted by skilled bag makers. The organic cotton is hand-spun, the fabric is block printed using ancient wooden blocks, and everything is stitched by women who have overcome or are overcoming great obstacles in life. Each item enriches the lives of at least 12 people involved in the production process including those with disabilities and from disadvantaged backgrounds. Story Behind the Label: The JOYN story starts with a Ugandan orphanage and a very unusual honeymoon. Back in 1998, Mel and Dave Murray met while studying. They married two years later and decided to spend their first summer as newly-weds working in an orphanage in Uganda. They knew they shared a passion to change the lives of people living in poverty. They just didn't quite know how to do it yet. After that experience, the Murrays set out to find sustainable solutions to the needs of those living in the majority world. Fast-forward ten years to 2010, and Dave and Mel sold most of their belongings, packed a few bags, and moved to Rajpur, India, with their two young sons in tow to start what is now a vibrant and successful company, JOYN. A big thank you to Thread Harvest, for sharing your time and passion with us! The next time you are thinking of buying something new, firstly consider if you really need it at all. This is the absolute first step to conscious consuming, as overconsumption puts a massive strain on our planet's resources. Try mending and upcycling, or even buying second-hand first. Secondly, when you are buying new, always make sure to do your research on the brand beforehand (luckily Thread Harvest have done this step for you). You want to be sure the brand supports your personal beliefs, and also a fairer future for the people and the planet.